Maybe, it’s just a name – Ramdas Dzhasuev, one of a few names from Multan, in present day Pakistan. A name that claws its way through layers of lost and forgotten history - of a bygone era of peaceful traders of 17th century Astrakhan, one of the few outposts for trading with Imperial Russia at the mouth of the Caspian Sea. Slowly, another name emerges from the mists of Time, Talaram Alimchandov who was from Sindh. The names may not mean much to historians who write for victors, but they do serve to illuminate an arc of Russian history woven into the fabric of Astrakhan and prove that India was no stranger in Russia’s backyard or in the “Stans” of Central Asia. For old Astrakhan was at one time teeming with Indian merchants and shining with Indian silk. From Kandahar in Afghanistan to Tabriz in Iran and Bukhara in Uzbekistan, Sindhi and Marwari business men were busy plying their wares, cementing networks and even building temples in exotic places like Baku, Azerbaijan. According to the eminent historian Stephen F. Dale’s book, “Indian Merchants and Eurasian trade, 1600 – 1750”, many of these traders had assimilated into the Russian environment, and married local women. However, the ebb of Time brought the scheming British into India, and their watchful geopolitical eyes ensured policies that kept Russia away from their empire. Also the Industrial revolution made it impossible for land based trade to compete with the steamship. Trade between India and Central Asia slowly came to a grinding halt. And after partition, Pakistan denied access to India by land or sea. Thus India remained cut off from the region for over two centuries. It seemed to be forever. But Time is a slippery thing and its pendulum always swings back and forth, and Astrakhan is back in the game hearkening India with its nostalgic call. India eager to get back to the old crossroads of flourishing markets continued to battle the huge barriers of a cruel Geography. However, now there is hope, shining like an outburst of light from a port called Chabahar in Iran. On September 1, 2014, a slow motion coup of history took place when an empty, muddy truck tagged with a GPS unit quietly trudged its way into the centuries-old city of Astrakhan. For the first time in over a century an Indian truck had made a dry run from Mumbai to Astrakhan via the Iranian port of Chabahar. 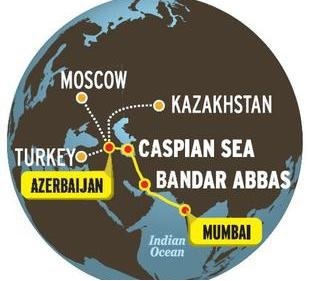 The Federation of Freight Forwarders Association in India, which made the dry run estimated that the corridor via Chabahar could slash freight costs to Russia by approximately 30 percent and take just half the time as is currently being pursued via sea through St. Petersburg. 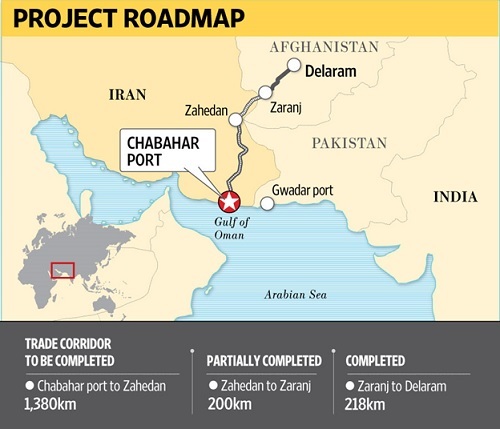 This and another dry run through Baku from Chabahar propelled the rise of the Chabahar project leading to the Chabahar agreement which came into existence in May 2016 with a series of MOUs to develop the Iranian port of Chabahar. The trilateral transit agreement or the Chabahar agreement signed by Iran, India and Afghanistan allows Indian goods to reach Afghanistan through Iran. Western ports in India can link to the Chabahar port which would then connect via road and rail links to Zaranj at the Afghan border. The Indian built Zaranj-Delaram road in Afghanistan will then connect to a garland-shaped highway called A01 which links vital cities with Kabul. A01 forms part of a wider highway project that would link Uzbekistan, Tajikistan, and Afghanistan and Central Asia. The Chabahar port and the road systems and rail network that it can tap into will not only provide direct access to Central Asia and Russia, but will also function as a vital base to counter the Chinese and the Pakistanis at Gwadar. The historical revolt and geo-political reset via Chabahar has been churning for over a couple of decades. Chabahar was just a small fishing village in the Iranian coast and went unnoticed for centuries. As the name suggests, char meaning four and bahar meaning spring, it is cool throughout the four seasons and is located in the Baluchistan and Sistan province of Iran. As per the 10th century scholar and historian, Al-Beruni, Chabahar’s old name is Tiz, which was at one time part of old India. Fast forward to the 1990s, and the historical stage is set with the Persian-gulf becoming the hottest spot during the Iran-Iraq war. Necessity for a deep water port away from the Persian-gulf brought Chabahar into the limelight, and Iran hired Indian contractors to begin work on it. After 2002, Pakistan played spoiler and denied transit rights for Indian goods to be shipped to Afghanistan via Karachi. This included crucial food aid that affected several lives in Afghanistan. The pettiness prompted the then Prime Minister Atal Behari Vajpayee to sign a deal with Iran in 2003 to develop the port and also build a road from Zaranj on the Afghan-Iran border to Delaram in order to access Kabul via the Southwest. The Zaranj-Delaram road was built but the port deal stalled and eventually stopped due to crippling sanctions on Iran. The spineless UPA not only failed to stand up to the superpower but also added to the pain by voting against Iran’s nuclear program in the U.N., when a simple abstention could have sufficed. The trust deficit enabled China to make a bid for Chabahar. It took all of Modi’s diplomatic skills and effort to stave off China and sign the Chabahar port development agreement in the nick of time - clinching the deal with a confirmation statement between EXIM Bank and Central Bank of Iran confirming availability of credit up to Rs. 3000 crore for the import of steel rails and implementation of Chabahar port commitment. The Chabahar project will eventually integrate with the ambitious International North-South Transport Corridor (INSTC) that rivals China’s One Belt One Road project. 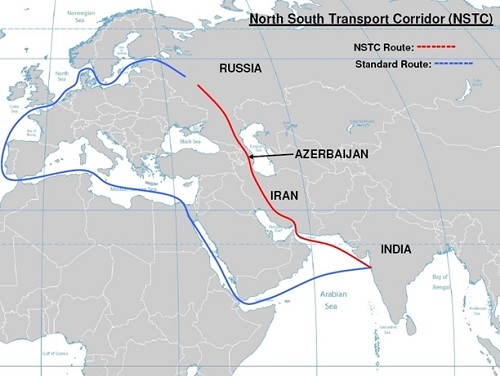 The INSTC project is a multi-modal transport network comprising of road, rail and water transport signed by Russia, Iran and India in September 2000 to promote regional connectivity and transportation. Goods will move from Mumbai to Bandar Abbas in Iran by sea, from Bandar Abbas to Bandar-e-Anzali (an Iranian port on the Caspian Sea) by road, and then from Bandar-e-Anzali to Astrakhan (a port in the Caspian Sea in Russia) by ship via the Caspian Sea and further into Russia and Europe by Russian railways. This is a much shorter, less expensive, safer and more secure route than the current ones that go through China and Europe. This route also bypasses Pakistan, reaches Central Asia and Europe and ensures a competitive advantage due to lower costs and less delivery time. India will be able to access huge deposits of Iron, Copper, Cobalt, Gold and Lithium in Afghanistan for development. It will provide access to high value rare earth minerals in Central Asia and Afghanistan in addition to gas fields. Since distance between Chabahar and Kandla port in Gujarat is less than the distance between Mumbai and Delhi, Indian businesses could get easily involved in the burgeoning Iranian economy. As per Nitin Gadkari, India spends Rs. 45,000 crore annually on urea subsidy, and if urea is manufactured in the Chabahar free trade zone and moved through the port to Kandla and onward to the hinterland, this would result in huge savings. Since 60% of the population work in agriculture, this could have huge ramifications. India gets to build 2 jetties and has guaranteed cargo volumes for these 2 jetties, which means it will be used exclusively for cargo to and from India. Preferential tariffs (lower rates of duty) offered by Iran for Indian goods could spur trade to Russia or Central Asia and is a huge game changer for ensuring viability and growth of the port. And there are more goodies available in the pipeline when some of the following projects materialize. India plans to invest in an Aluminum smelter plant, petrochemical intermediaries and also gas intensive industries in the free trade zone which can reduce the price tags on these products currently being imported from elsewhere. India is also negotiating a deal to develop Farzan-b gas field in the Persian Gulf which an Indian consortium has discovered to have 12.8 trillion cubic feet of gas. Once negotiated, Chabahar could be considered for transporting the gas to India. Chabahar port will facilitate transportation of gas resulting from India’s proposed entry into the Oman-Iran-Turkmenistan-Uzbekistan Ashgabat agreement, from Central Asia and also enable transport of LNG through ships or pipelines to energize India. Chabahar is also one of Iran’s free trade zones and a huge incentive for foreign companies to invest. The more Chabahar becomes viable the less Gwadar will be used. Though coached in politically acceptable language, there is also a strategic and military aspect that would accrue to all the involved nations. At the signing of the trilateral transportation agreement, Modi said the deal would “strengthen our ability to stand in mutual support against those whose motto is to maim and kill the innocents,” leaving little doubt that he meant the neighborhood thug Pakistan. He specifically commented on the strategic dimension of the deal. “We have also agreed to enhance interaction between our defense and security institutions on regional and maritime security.” For Afghanistan, the port is particularly important as it will provide more options for Afghanistan when the Americans eventually withdraw in 2017 or beyond. It would also be a liberation from the bigoted and merciless Pakistanis who have maimed, brutalized and exploited their poor and weak nation. For India the strategic aspect could lead to acquiring a base in Iran and Afghanistan. A navy base in Chabahar and an air force base in Afghanistan can be useful in retaliating against Pakistan for terrorism anywhere in India. It could also preempt the Chinese navy from foraying into the Indian Ocean. Moreover as Brookings institution fellow Tanvi Madan told CNBC that by investing in Chabahar port, India could keep an eye on China’s activities not only in Pakistan but also in the Middle East. For Iran, Chabahar reduces Iran’s vulnerability to international pressure in case the enemies of Iran close the strategic straits of Hormutz, one of the world’s most important choke point, through which 17 million barrels of oil flow on a daily basis. It will also save millions of dollars that it currently pays Dubai for access to its deep sea port. Since Bandar Abbas (Iran’s other port) is not a deep sea port and therefore cannot receive ships exceeding 100,000 tons, the heavy cargo laden ships destined for Iran get diverted to Dubai. Dubai wins and Iran loses. Now with Chabahar, Dubai will lose the traffic that was diverted from Iran. More business is more viability. According to a May 15, Times of India report Japan may partner with India to develop Chabahar and is considering building an industrial complex there. Japan’s PM Shinzo Abe is planning a visit this August to Iran for the first time in 38 years. The visit may result in Japanese investment for major infrastructure projects in Iran. According to the strategic affairs expert, Brahma Chellaney, an India-Japan partnership on developing the Chabahar port and industrial complex will be a win-win initiative for all parties including Iran. “Chabahar has greater potential than Gwadar to emerge as a key shipping hub. An India-Japan partnership on Chabahar will help to counter the strategic significance of the expanding Chinese footprint in Gwadar,” he says. Washington will also be supportive of Japanese investment in Iran. Hopefully, Japan’s entry will reassure other countries to build industries in the free trade zone. This would indirectly ensure a balance so that China does not muscle in with its money bags. Most of all it will also ensure compliance by Iran if countries with more economic and political heft are involved. The Pakistanis have been gloating endlessly about Gwadar and about how the Chinese will alchemize the sands of Gwadar to Gold. Their fantasy land hit brutal reality when the Baluchis killed a few of their “higher than the Himalayas,” friends. Also, lament from Pakistani-analysts trickle through regarding the serious water problem plaguing Gwadar. The city has chronic fresh water shortage which at present is provided by Iran. There is no desalination plant on the offer by the autistic Chinese, and there could be a serious water shortage, possibly sinking the project. Operating on assumptions that Iran would not come out of the sanctions regime, and that the Pakistanis would ensure security in Baluchistan and Afghanistan the Chinese had picked the port of Gwadar 43 miles East of Chabahar. Countries are not rushing to invest in Gwadar as access via CPEC (China Pakistan Economic Corridor) passes through restive Balochistan, freezing Himalayas and landslide prone Karakoram highway. The Chinese seem to be dragging their feet, making the frantic Pakistanis looking for a way to restart the process. No wonder the Pakistani foreign minister Sartaj Aziz wants to build a road to connect to Chabahar. This would definitely reduce the viability of Gwadar and another win for Chabahar, the only deep water port straddling important sea lanes of commerce. Finally, after a long, long time the fetters to India’s long sought corridor of opportunity will loosen and old markets in Astrakhan, Baku, Tabriz and Bukhara will reopen with Indian goods, information technology services, manufactured goods and pharmaceuticals while gas from Turkmenistan and Kazakhstan will flow into energy hungry India. The Chakravyuh enforced by the Chinese via Gwadar, Colombo and Hambantota is finally broken by a smashing diplomatic coup ending the siege of centuries. It remains for India to maintain the surging momentum provided by this wonderful swerve of history. As Shakespeare so profoundly stated, “There is a tide in the affairs of men. Which taken at the flood, leads to fortune.” So be it with Chabahar. Thank you Mr. Kinzie for taking the time to post your comments. I hope you will like my other forthcoming articles as well as this one. I am an old man who spent nearly a decade of his early life in Gujarat. and this deal to develop a port that opens up more trade seems a significant item. Hi Balijee - thank you so much for your nice, encouraging comments. It gives me great pleasure to receive your applauding response. I am simply overwhelmed. A landmark in meticulously researched writing. You've, Aneeta, done a splendid job. Keep it up.